After Windows Phone 7's grand unveiling at Barcelona's Mobile World Congress last month, Microsoft has circled back during GDC and its own MIX10 conference to fill in many of the holes in this story -- in particular, details around the app development ecosystem and how third parties can take full advantage of it have been focal points. Of course, it makes sense: a modern smartphone is only as good as its software catalog, and Redmond's clearly keen to show that it knows how very true that is. XNA -- the technology that underpins Zune games and a host of Xbox content -- figures prominently into the equation, but Silverlight is a huge, unavoidable component as well, making development for WP7 devices a starkly different experience for studios and independent code monkeys than in versions prior. We're going to be periodically updating this post as we get new info on the platform, but for now, follow the break for everything you need to know -- so far -- about Microsoft's latest and greatest mobile platform. 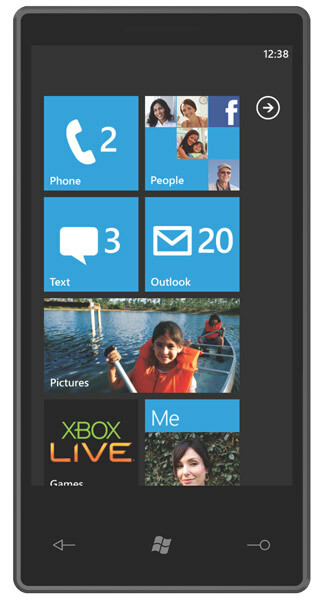 Windows Phone 7 is the successor to Microsoft's line of Windows Mobile phone operating systems. It's based on the Windows CE 6 kernel, like the Zune HD, while current versions of Windows Mobile are based on Windows CE 5. Microsoft announced the new OS at Mobile World Congress 2010 in Barcelona, and says that the first handsets to run it are supposed to be released by the holiday shopping season of this year -- and the company is emphatic in saying that it doesn't mean December 24th -- you'll have time to place your order. The visual and underlying differences in the operating system are almost too numerous to mention, including a completely (and we do mean completely) upended user interface, an emphasis on finger-based touchscreen input, deep social networking integration, fully branded and expansive Zune and Xbox components, and extremely strict hardware requirements for partners. A couple familiar touchstones from the past include plans for Outlook and Office support, as well as licensing to a wide variety of third party hardware vendors -- despite the name change, Microsoft still isn't building any phones itself. Microsoft says it's aiming the platform at "life maximizers," and it's come up with a fictitious 38 year-old couple named Anna and Miles who represent the target end users: people who need to get work done on their phones but still want to play games and don't want to fiddle around with settings. It's cute, we'll give them that. Part of what makes Windows Phone 7 a departure for Microsoft is that the company is taking a much bigger role in dictating what hardware is allowed to run the OS. While we still haven't seen a retail-quality device (the demo unit being used for testing internally is a prototype slab made by Garmin-Asus and won't ever come to market), Microsoft has a very clear picture of what they want these units to be built like, and both LG and Samsung have come to the table with prototypes that approximate what we might see on store shelves this year. Still, while the company is laying down the ground rules in an attempt to create a more consistent experience across phones, it doesn't mean there won't be variety. Different devices will have different features, like hardware keyboards and front-facing cameras, but overall there will be a much more steady tone in the nature of Windows Phone 7 handsets. At first, only large 800 x 480 (WVGA) touchscreens will be permitted, but 480 x 320 (HVGA) devices will make an appearance "later." Five specific hardware buttons are required: Start, back, search (which integrates with Bing services where appropriate), camera button, and power. Some devices might have more, but these are the baseline. Apps aren't generally allowed to override these buttons -- it's an offense that could result in being rejected from the Marketplace. Capacitive multitouch with support for a minimum of four contact points, though no more than two are used by any of the platform's six native gestures (developers are welcome to use as many as they like). A Qualcomm Snapdragon CPU with DirectX 9 graphics support. Microsoft says the platform is flexible enough to expand to other chips in the future, but right now it's all Qualcomm. No support for microSD cards, though that's partially offset by the requirement for capacious internal storage. Some phones might implement the required internal storage on a microSD card, but it's not supposed to be user-swappable, and if you do switch it out, you'll reset the phone and lose all your data -- but you should be able to get most of it back when you sync with the cloud. 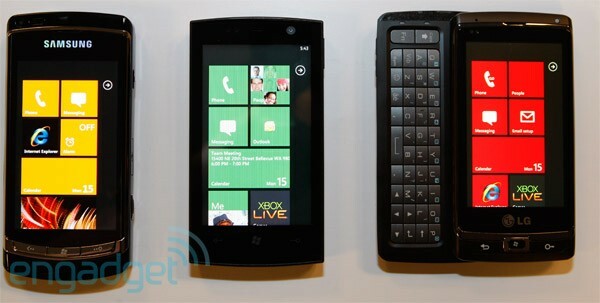 As we said, Microsoft is primarily showing the OS off on unbranded prototype hardware. It's a simplistic slate phone with a 3.7-inch capacitive touchscreen, what appears to be a front-facing camera... and not much else. We've also been up close and personal with an LG slider QWERTY prototype on The Engadget Show, and we've seen fleeting glimpses of a Samsung slate prototype that's apparently just a hacked-up Omnia i8910, but we haven't been given any hard specs or even confirmed that either device will ever be sold. We've also been told that HTC is working on several devices, although there's been no official announcement. We're sure there will be tons of other hardware partners in the future as well. As an aside, Microsoft tells us that right now they're only building this OS for phones -- we're sure there are implications here for the Zune platform, but don't expect any new devices there for a while. 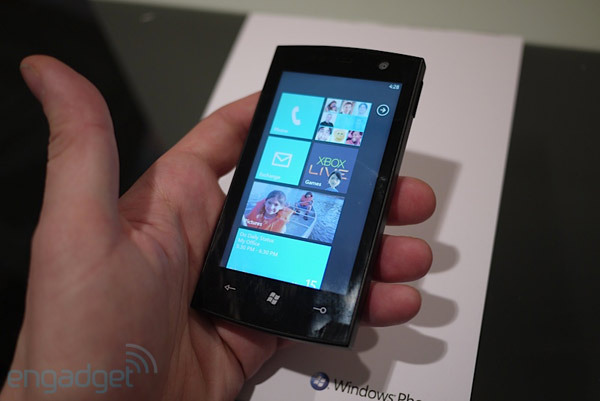 So, how exactly is Windows Phone 7 different than previous versions of Windows Mobile? The question is probably better phrased as "how isn't Windows Phone 7 different than previous versions of Windows Mobile?" This isn't a coat of paint or a touch up -- this is a full-scale nuclear assault on everything you knew about Windows on phones. Basically, every interface paradigm you've seen in earlier versions is obliterated here, and the design has been utterly decimated, in a very, very good way. There's no longer a Start menu, drop downs, check boxes, radio buttons, windows, lists of icons... we could go on and on, but suffice to say this thing is just a totally different beast altogether. Microsoft clearly worked long and hard developing new ways to navigate a phone, and this doesn't even bear a resemblance to other phones currently on the market. There are no icon grids, no pull down menus, no card view, and no task manager (more on that in a moment). So what is it actually like? Well, it's a lot like the Zune HD. In fact -- it's just like the Zune HD... but more. Microsoft says it's drawn on its Zune and Windows Media Center UI concepts and come up with something it calls "Metro," a type-and-motion heavy interface based on primary colors and lots of minimal, negative space. Whatever you call it, however, it should be very familiar to anyone who's ever glanced at a Zune HD, because it incorporates all those weird interface tweaks that made it so distinct, like large, bold text that trails off the screen, menus which move dimensionally in and out instead of just side to side, and the sense that you're panning over long, single pages of information, rather than a set of separate panels. Another way Microsoft refers to the look is "chromeless," which can best be witnessed in the clean, sharp "tiles" which dominate the home screen, completely lacking in any real world-inspired bevels, drop shadows, curves or textures, or the Tron-like calendar app, dialer, and alphabetical contact search grid, which look like they've been built out of spare parts from Tempest. There are two "themes" for the OS, which basically boil down to light text on a black screen (the default) or dark text on a white screen, and you can pick your choice of four accent colors: red, orange, blue and green. Obviously we're hoping this is expanded in the future. 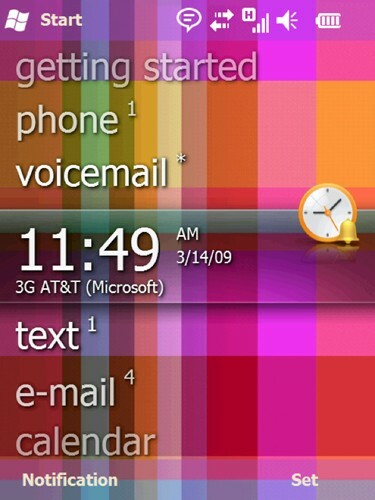 The OS's unlock screen is similar to the Zune's; a large photo that can be dragged upward to unlock the device, though it also includes time, date, upcoming calendar items, number of unread messages, and number of missed calls (imagine that -- information on a lock screen!). Behind the unlock is the Start screen, which is composed of user-configurable and movable "tiles" in a somewhat narrow strip down the middle of the screen, either in sets of two across, or longer single tiles. Tiles can be linked to an app (like Internet Explorer), a specific contact or website, a photo gallery, playlist, can function as a standalone widget, or reach out to one of the "hubs" which comprise the majority of the phone's functionality. In fact, there seems to be no end to what you might be able to link the tiles to, apart from the creativity of app developers. Tiles are live and animated, with changes coming in the form of status updates from friends, new photos, new messages, upcoming calendar events, and so forth. Your most used or best loved tiles can be "promoted" to the top of this list, meaning that what you are most likely to reach for is easily accessible, but as your habits or use change, so does the arrangement of your Start screen, and the list of tiles is infinitely long, as far as we can tell. Hubs are where things really get interesting, however. Microsoft described the hubs to us as an "app that makes sense of your apps." Instead of icon screens or just the applications themselves, Microsoft offers a weird kind of middle ground -- sections of the phone where further action can be taken. You're not diving down into obscure menus here; rather, you're interacting with a subset of functionality within the OS or applications. When you jump into a hub, you land in a horizontal-scrolling interface, with a series of scrollable data streams and views in parallel that you can "pivot" to. Again, this should be very familiar to Zune users. The content in a hub is composed of both locally-stored data and cloud-sourced information such as photos, contacts and so forth, and each hub has its own particular emphasis. The cloud-connected content is interesting, because ideally it means you'll be able to browse both locally stored data (such as a photo gallery) or a server-side collection in exactly the same way, with no break in the user experience or separate action required. Unfortunately, Microsoft says there's no way to order the data sources feeding the hubs by priority or preference -- if you're Facebook friends with someone who's constantly uploading photos you might find that the "new" view in the Photos hub is a little less than useful. We'll have to see how this one plays out in practice; it's definitely a problem on similar platforms like MOTOBLUR. Core-functionality applications have a similar but more minimal interface, centered around a single task like SMS or email, while still relying on the swipe (or pan or pivot, whichever term you refer) motion to switch between views. At the bottom of the screen is an "app bar" that has a few icon shortcuts to common commands (like add calendar item or back and forward in the browser), but which also can be pulled up like a drawer to reveal further commands available to the user. Additionally, the search button is contextual, meaning that depending on where you're located on the device it can have slight variations on behavior. For instance, when you're in your contact list, tapping search will call up a contact search, as opposed to dropping you into a web or device search. Make no mistake about it though, Bing is your main avenue of search with this device, and Microsoft is pushing its engine hard, making it a central part of the user experience for both local (that is, local to the phone) and external content. 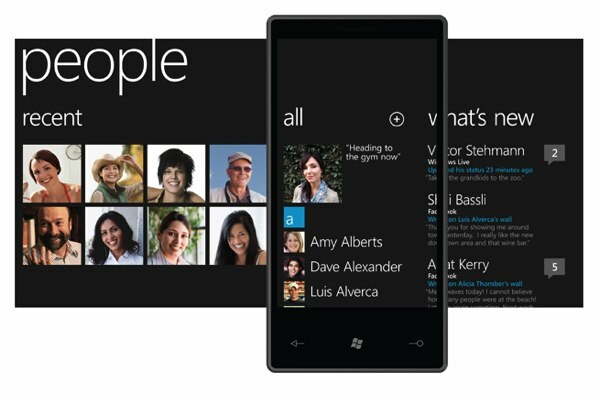 Also present in Windows Phone 7 is an all-new touchscreen keyboard, somewhat similar to its Zune HD counterpart, but with some significant auto-correction, along with the ability to tap a word you've already typed and select or type a correction for it. Unlike previous versions of Windows Mobile, Microsoft is taking direct ownership of the touch keyboard experience here, and the results are seemingly quite good -- although, to be fair, we've seen more than one Microsoft employee struggle with it during demos. There's even a dedicated button to reveal a bevy of emoticons when updating your status, though this isn't unheard of -- Android features a similar set. There's no traditional multitasking in Windows Phone 7 -- although media / email sync and some of the built-in apps like Zune and the browser can run in the background, in general most apps won't simply be able to carry on when you switch away from them. We were initially told 7 might eventually allow some apps to provide certain capabilities (music streaming, for example) while they're not visible to the user through the use of background services, but Microsoft has backed down from that recently; the latest line is that they understand the need for this kind of service-based multitasking capability, but it won't make it into the initial release, and there's no word on how long we might have to wait. Apps aren't simply killed off after the user stops using them, though. The platform supports "page states," which Microsoft equates to cookies on websites -- they're lightweight packages that can easily be kept in memory to preserve the look, feel, and data of an app while discarding the memory-heavy UI elements. When a user navigates away from a screen within an app, the page state is committed to memory; when it's needed again, the UI is reconstructed from the state, a process cleverly called "dehydration" and "rehydration." Speaking of multitasking, Microsoft will be offering a system called the Microsoft Notification Service for pushing app notifications to devices in real time without the apps needing to be open. The notifications appear as a bar at the top of the screen that can be tapped to take you into the relevant application; the system is halfway between Apple's annoying modal dialog box and Palm's unobtrusive webOS notifications. Apps can also use the push system while they're running to refresh content instead of having to constantly fetch new data themselves -- it's an interesting tactic to save battery life. Beyond the lack of true multitasking, Microsoft has another notably absent headline feature that'll undoubtedly ruffle some feathers: copy and paste. In light of the flak Apple took for leaving copy and paste out of the initial releases of the iPhone's OS, you'd think Microsoft would've taken the plunge and made this happen, but we get the impression it's all about time constraints here and they simply prioritized a real clipboard too low on the list to make the cut for the first release of the platform. Instead, they're offering up some supposedly rich data-detection services that will sniff out phone numbers from messages and documents and the like, which cuts the pain a tad -- but it's certainly no replacement, and the company's lines about end-users not actually needing a clipboard system ring a little hollow to our ears. Since the initial announcement, Microsoft has softened its line a bit, with the company's Charlie Kindel saying that they want to "do the right thing" with the capability -- it just won't be available at launch. 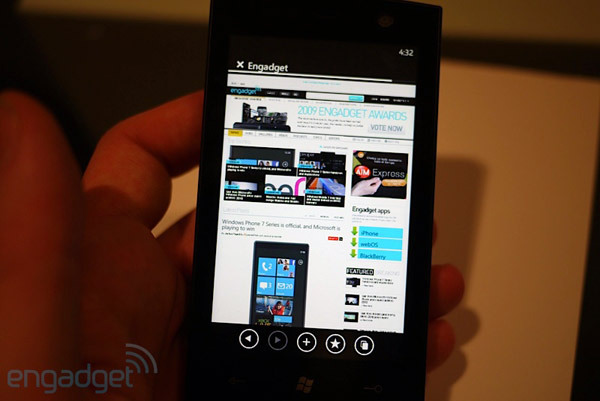 So how does Windows Phone 7 feel? Well, right now it's rough -- we've now seen multiple different builds of the software running on three different devices, and it's obvious that things are changing rapidly. Some things seem solid and connected, but there are clearly holes where this software is unfinished, and components of the interface that still require some serious debugging, and we've seen these early builds crash a lot. The touchscreen in particular troubled us, as we saw inconsistent results from scrolling and tapping: sometimes there was no reaction at all, sometimes it went a bit crazy. We have reservations about other things as well, like the time it takes to jump from one task to another -- we're hoping that the company gives us options to tweak animations and interface settings to some extent. Microsoft has to take the next six months or so to complete this really fresh OS concept and then put a serious amount of polish on it -- it's going to be a lot of work, but the raw materials are really impressive. You can't completely get a feel for something as complex as a modern smartphone OS in a couple of minutes or even hours of use -- it's the kind of thing you need to live with. We're hopeful about what Microsoft has shown us, and think that as long as they stay as aware and realistic as they've been so far with Windows Phone 7, the possibilities for success are strikingly high. People hub: Pulls in contacts from Gmail, Exchange, Facebook, Twitter, Windows Live and others, aggregating contact information, status updates, and contact images into a single view (or views, really). The main view of this hub keeps your most recently or heavily contacted people in first view dynamically (though this can be customized as well), and allows you to quickly jump to feeds of your recent updates from social networks aggregated by Windows Live. There's also a section here called "me" where you can view and edit your own statuses within your networks. Pictures hub: An aggregate of your locally stored photos, cloud-based Facebook, Windows Live, or other connected picture galleries, and feeds of your contacts' recently updated images. The pictures hub will also allow you to upload and comment on photos on services like Facebook natively inside of the hub experience. 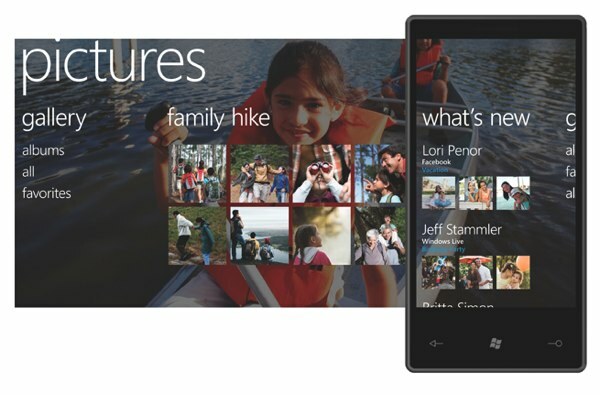 Photo apps can also plug into the Pictures hub to offer editing and sharing functions as well. Like we said earlier, you can't order photo sources by priority or preference, so we're a little concerned that this hub will be quickly overrun, but we'll see how it works in practice. Games hub: Integrates with Xbox Live, including the housing of a miniature version of your avatar (in 3D and everything), Xbox LIVE games and achievements, Spotlight feeds, and the ability to browse gamer profiles. Microsoft says it wants games that are easy to play in the "mobile minute," and is focusing on turn-based games to start, but we've now seen a few impressive 3D XNA games shown off, complete with Xbox achievements and other features pulled in from Live. Integration with Xbox and its ecosystem is being taken very seriously by the folks in Redmond -- you're not just going to be playing Sudoku here. This should be an easy one to not screw up. 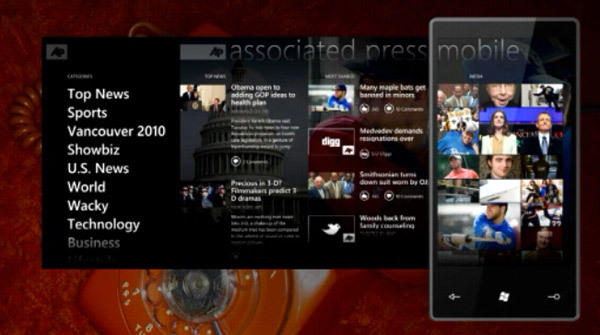 Music + Video hub: It's a Zune HD in your phone. Seriously. It's exactly like the Zune HD experience. You're able to utilize Zune Pass here too, including the ability to browse and download new music over WiFi and 3G. Video is a go too, and we assume that means rentals as well as purchases, but it's still unclear how this will interact with your desktop, Xbox, or Media Center setup. Microsoft initially said it was working with partners like Pandora to integrate with the hub, utilizing the Zune player to tap into Pandora's streaming service, but they've backed off that message dramatically, and it's not clear at all if this feature will still make it into the launch release. Divx playback will be supported out of the box, something that a number of higher-end featurephones and smartphones have integrated in recent years. 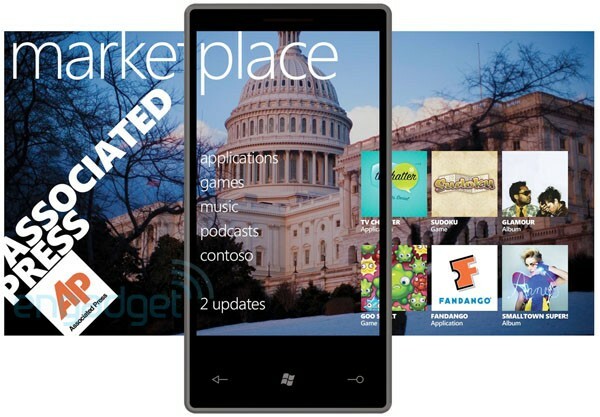 Marketplace hub: Microsoft is deeply rethinking its Marketplace strategy for Windows Phone 7 right down to the name -- it's now officially "Windows Phone Marketplace," a minor tweak from the Windows Marketplace for Mobile moniker they'd used before. The revised Marketplace will be much more than an app store -- instead, it'll be billed as a one-stop shop for a variety of content from apps and Xbox games to music, and carriers will also have the ability to customize it by adding their own highlighted content. Much more on Marketplace below. Office hub: Microsoft's bread and butter, but so far we've just seen the hub itself -- none of its deeper functionality like document editing. There's an emphasis on OneNote and SharePoint Workspace that should be pretty interesting, however. Ultimately, based on the new UI paradigms and user experience directives of Windows Phone 7, Microsoft is going to have to rebuild these applications from the ground up. As long as they're able to make them super functional while keeping the Metro look intact, this should be a real win -- we're still curious as to how the company plans to cram all that information into a UI which is focused on doing away with visual noise, and the lack of system-wide clipboard functionality is going to be an issue here, no matter how much Microsoft insists users only want to view documents and add comments. Email: Relies on swipes to switch between message views (unread / flagged / etc. ), and has a color-coded system for differentiating between work and personal messages. We're hopeful there's an option to un-mix multiple inboxes as well, but it's unclear so far. Microsoft's focused the app on mobile "triaging" of email, so there are robust tools to manage multiple messages, but there's also a lot of negative space in the app, which is a bit of a concerning (if beautiful) trend throughout the UI. We don't expect any deep integration with services like Gmail beyond the contact syncing... though if Microsoft could pull labeling, archiving, and threaded messages off here, we can think of at least one editor who would be seriously inclined to switch to this platform. Calendar: One of the odder apps visually, it almost looks like a DOS UI, with a white-on-black / primary color presentation. There are differentiations for specific types of data, such as red and blue notation for personal items and work. As we said earlier, this is weirdly one of the most striking applications on the phone, with lots of interesting functionality tied to its visual elements, like little lines in the day boxes which represent appointments when you're zoomed out to a month view. There's also a cool little "I'll be late" button, which automatically sends messages to meeting participants when... you'll be late. SMS: It's barebones so far, but supports SMS and MMS, and it appears that the keyboard can be rotated to landscape for text entry. Phone: Even barer bones -- chromeless is in full effect here. The UI isn't nearly done yet -- the white arrow is supposed to bring up call options, but it doesn't do anything at the moment. Bing search: Search has contextual use in most apps, but from the Start menu it pulls up a separate, dedicated Bing app. When you search, Bing will try to decide what sort of search you're doing and present an appropriate set of results -- local results instead of web pages if you're looking for sushi, for instance. You can pivot between views, naturally, and the results are presented in the standard Windows Phone UI instead of just a mobile browser version of Bing. Bing Maps: Addresses throughout the phone are turned into hyperlinks that can pull up Bing maps (phone numbers and email addresses are also intelligently discovered by the OS and made linkable), which includes pinch to zoom navigation and an auto-switch from map to satellite view at a certain zoom level. Microsoft is really pushing geolocation here, though we assume users will be given an option on whether or not they want to be found. "Delighters": What you see here isn't the full list of functionality and features -- Microsoft has said it'll be rolling out "delighters" over time that extend the platform in unique and interesting ways. We don't know exactly what they'll be, but we were flat-out told that copy / paste support isn't among the group, so that's that. Though there are countless huge changes for manufacturers, developers, and users alike in Windows Phone 7, one of the largest is going to be the third-party app ecosystem: you must get your content from the Marketplace, a far cry from the Wild West attitude of the WinMo 6 days. In fact, you could even argue that it's a little bit more restrictive than Apple's already-draconian app distribution policy in that there won't initially be any provision for an ad hoc distribution mode that allows you to bypass the Marketplace and distribute your app (say, to a small company or for beta testing) to a limited number of users; Microsoft says that they're keenly aware that there's interest in such a feature, but they simply weren't able to target it for the first release, along with a full-featured app distribution solution for large enterprise customers. The company is promising a "predictable and transparent" process for app approvals based on constantly-evolving "business, technology, and content" policies, and the final versions of those policies are expected to be detailed for developers in May 2010. We can tell you that there won't be any silly "duplication of functionality" rejections: Microsoft says it won't reject a Google Maps or Google Voice app, or replacement email clients -- or even browsers, if some dev manages to code one up in Sliverlight or XNA. Marketplace's pricing policies are pretty similar to Apple's in many ways: 70 / 30 revenue split between the developer and Microsoft, $99 a year for a developer program membership which currently allows 5 apps per account (that may change prior to launch), and there's no ongoing cost to the developer for publishing free apps, which can be ad-supported if the developer so chooses -- although the ads will be subject to the same content guidelines as the apps themselves. We've already seen one obtrusive pop-up ad in the Associated Press app, and we're hoping the platform's Silverlight foundations don't encourage annoying and overbearing animated ads in free apps. It's a fine promise overall, but Microsoft has its hands full here, especially since it's trying to enforce the same moral standards globally -- we have no doubt that the company has only the best intentions in mind, but we can guarantee we'll see at least one or two App Store-style PR disasters with rejected Marketplace apps. It's just the nature of subjective regulation like this. Development for Windows Phone 7 takes place using a toolkit that Microsoft provides for free, consisting primarily of phone-centric editions of Expression Blend and Visual Studio 2010. Most applications will be developed entirely in Silverlight -- a technology that's been billed as a Flash competitor, though Microsoft and Adobe have both said that they're planning on adding Flash support to the platform sometime after the initial launch. WP7S supports what Microsoft describes as "full Silverlight," touting that existing Silverlight developers will have an incredibly easy time porting their apps to the platform, though complying with the look and feel of the Metro UI will naturally require some tweaking. We've seen some seriously impressive demos of Silverlight development -- we watched a Microsoft dev code up a bare-bones Twitter client in under 10 minutes, and the Seesmic team said they reused the majority of the code that powers Seesmic Desktop on the Mac and PC. Game developers, meanwhile, will take advantage of the platform's support for XNA, the same ecosystem used by the Zune HD and the Xbox 360. Apart from a handful of shared APIs, Microsoft says that devs will need to basically choose Silverlight or XNA and run with it when creating a new app, but that the long-term goal is to merge the platforms in a meaningful way. For what it's worth, Microsoft has committed to bringing Silverlight support to Xbox -- and the company's strategy strongly suggests that future Zune iterations will support it as well -- so it should eventually be a fairly trivial matter for a studio to bring the same app to the PC, PMP, console, and phone with relatively little pain. Microsoft is spending a great deal of time chatting up the development advantages of having a very stringent, narrow set of target hardware specs; we've certainly seen software fragmentation on other platforms (Android in particular) as a direct result of vast differences in hardware and software capability that make it difficult for some apps to run seamlessly across every device. One fragmentation point in WP7S, though, is the display -- though 800 x 480 is the only resolution at launch, 480 x 320 will be added later. To ease the pain, Microsoft is including software scaling capabilities out of the box that will allow the same apps to run on either display with little or no modification (and they're actually encouraging game developers to consider falling back to 480 x 320 or even 400 x 200 for higher performance -- the system can change on the fly). Associated Press: AP's mobile apps have become mainstays for many folks, so it's no surprise that Microsoft was keen to show this one off. It makes full use of Windows Phone 7's "panorama" view, which serves to make it a distinctly different experience than you'll find on the iPhone or Android versions. There's also a nifty photo browsing tool that flips out images in a fan -- it's very trick. The AP app is a great showcase for what devs can do if they fully engage the Metro UI -- something that not every app we've seen does well. Netflix: This is more than your average Netflix queue manager -- the company's prototype WP7S app actually bundles Watch Instantly functionality, meaning it becomes a source of entertainment on the road. Interestingly, Netflix is emphatic that they haven't "announced" a Windows Phone 7-compatible app, they've merely prototyped one; that being said, we'd be shocked (and saddened) if this didn't become available at or near the platform's retail launch. 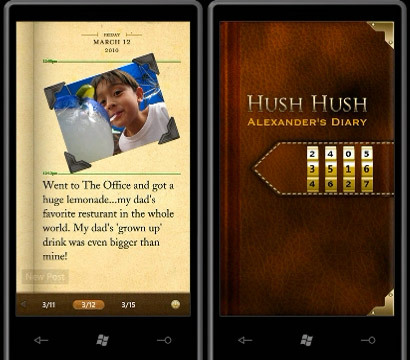 Hush Hush: WP7S apps aren't required to live and breathe the Metro UI style, and Hush Hush is a perfect example of that. This diary app looks... well, like a diary, which should function pretty well on the large WVGA displays that these devices will have out of the gate. Neat little feature here: you can bypass the lock by "smashing" the phone. MLS: This is an official app developed in cooperation with Major League Soccer -- it's the usual stats-and-video-clips affair, but it served as Microsoft's first official demo of the so-called Microsoft Notification Service that pushes notifications to WP7S devices in much the same way that Apple's system does. The app doesn't need to be running in order for users to receive alerts. Seesmic: This is more or less a straight port of the same experience Seesmic offers on Windows on Mac, a testament to how easily they were able to port their Silverlight-based client. Shazam: Shazam's been pretty great at making sure that it has presence on every mobile platform of note, and Windows Phone 7 is no exception -- they took the stage at MIX10 to commit to the platform, so you can rest easy knowing that you'll have no trouble identifying songs with your shiny new WP7S handset. Goo Splat, Battle Punks, and The Harvest: These games come from different backgrounds -- Goo Splat's an XNA game on Zune HD that shows off how quick and easy it is for studios to port their existing stuff, while Battle Punks and The Harvest are 3D games capable of showing off Windows Phone 7's deep Xbox Live integration. Microsoft has stated very clearly that Windows Phone 7 represents a complete and total clean break for the platform -- in other words, your legacy Windows Mobile applications will definitely not work out of the box. There are a variety of valid technical reasons for that, none bigger than the fact that WP7S is based on a very specific set of Microsoft developer tools; you simply can't go outside of the XNA / Silverlight sandbox. The company hasn't committed to offering developers any specific tools geared at helping them migrate old apps, but the user interface best practices and underlying architectures are so starkly different that it might not even be technically possible to offer such a tool -- in other words, developers can and should expect to rewrite their apps from the ground up, just has Microsoft has done with the platform itself. 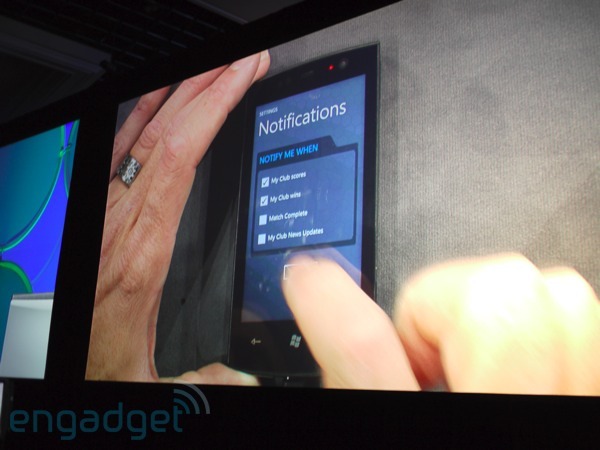 That also means existing Windows Mobile 6.x-based devices won't get official upgrades to Windows Phone 7. Microsoft and its hardware partners were initially less than forthcoming on that issue, giving a series of non-answers that merely muddied the issue -- especially in regard to the HTC HD2, which features a Qualcomm Snapdragon processor and very large capacitive 800 x 480 display, specs that match Microsoft's 7 Series requirements. However, we were finally told at MIX10 that an update wouldn't happen because the HD2 is "not compliant" with the WP7S hardware requirements. If we had to guess, the HD2's old-style button layout is the problem, though we may never get a straight answer from either Microsoft or HTC on the matter. Regardless, the HD2 was the high-water mark for Window Mobile 6.5, and if it isn't making the cut, we doubt any other currently available device is going to either. So, where does this leave existing Windows Mobile users? Well, your phone still works, and since Microsoft has eliminated any sort of upgrade path, we're guessing there will be a pretty vibrant community of non-upgraders who will develop for and support existing Windows Mobile devices for years to come. And let's not forget, the HD2 is a pretty amazing device -- if you need Windows Mobile, it'll be more than enough phone for several years to come. What's more, Microsoft is positioning Windows Phone 7 primarily for consumers right now, which means it has an interest in keeping Windows Mobile alive and well supported for the enterprise -- and there's a slew of new Windows Mobile 6.5.3 devices that are on the market. Any reports of the death of Windows Mobile are greatly exaggerated, but it's also not an exaggeration to say that Microsoft has gone "scorched earth" in developing toward its primary future in phones. Perhaps one of Windows Mobile's most stand-out features in recent years has been its customizability -- rarely have partners left Microsoft's default skin untouched, replacing it with variants of TouchFLO / Sense, TouchWiz, Spb, and so on depending on the manufacturer and model. Windows Phone 7 puts a strict ban on those replacement skins, instead demanding that products ship with the standard experience -- so it'll be considerably more difficult for HTC, Samsung, and others to differentiate themselves. Manufacturers have the option of adding features to the platform's standard hubs and bundling apps, but otherwise, we haven't gotten any indication that one phone's build of WP7S will look much different from any other's. 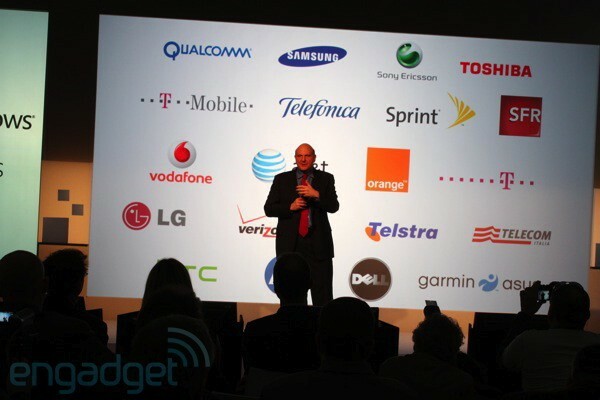 Naturally, there are plenty of companies -- both on the hardware and carrier front -- on board for Windows Phone 7, and so far support has been pledged by Dell, Garmin-Asus, HTC, HP, LG (rumored to have a device ready by September), Samsung, Sony Ericsson, and Toshiba on the hardware end. When it comes to carriers, the list is even longer, including AT&T, Deutsche Telekom AG, Orange, SFR, Sprint, Telecom Italia, Telefónica, Telstra, T-Mobile USA, Verizon Wireless and Vodafone. 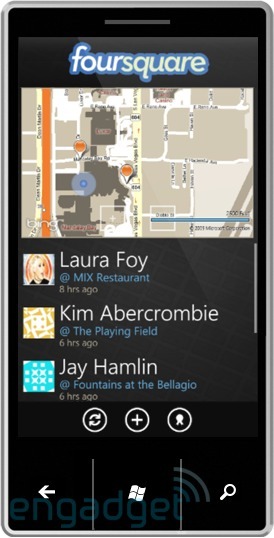 Needless to say, there will be no shortage of availability when WP7 comes to market. On the developer side, Microsoft seems to be acutely aware of how badly it needs to come big on the app and software front. 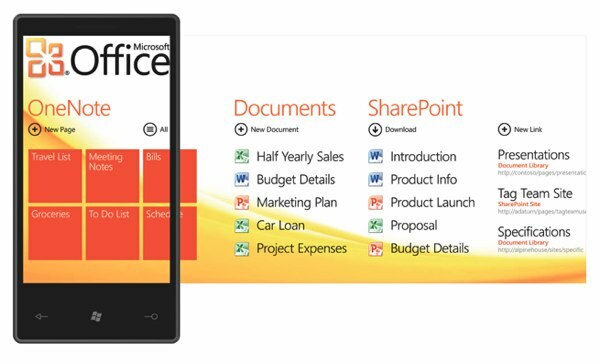 One thing Microsoft has always prided itself on was developer love (c'mon, we've all seen the video), but in recent years the company seems to have taken a backseat while Apple has been blowing everyone away with its easy-to-code, easy-to-market solution for software on the iPhone and iPod touch. 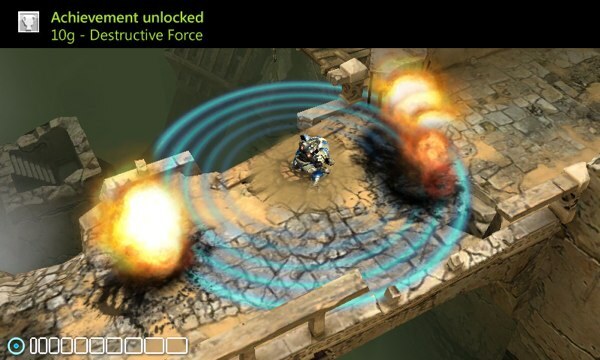 For better or worse, Microsoft seems to be emulating part of Apple's strategy with its curated Marketplace, but with potentially even lower barriers to entry, since the basic elements of developing for Windows Phone 7 are all built on extremely familiar foundations and the same code can be deployed on Windows and the Xbox. That's great, but it's how developers take advantage of the new Metro UI and the deeper concepts of 7 Series that will make all the difference -- we've already seen some apps that really run with it to achieve spectacular results, like the AP app, and other apps that deliver a more modest experience that's very similar to other platforms, like Shazam. It's up to Microsoft to define expectations for the platform and really encourage developers to explore new ways of doing things -- not an impossible challenge, but not a walk in the park, either. Consumer experience aside, Microsoft is also stepping up its game with its developer tools, committing to deliver everything a coder needs to take an app from concept to reality for free (which is exactly how it should be -- developers are a platform's best allies, after all). The tools seem extremely slick, too -- perhaps not as ridiculously effortless as Palm's Ares SDK, but certainly a walk in the park for seasoned Microsoft developers coming from other segments of the business. We were struck, for example, by the fact that you don't need to compile an app to run it as you're developing it -- you just hit "play to device" and your little creation is running on an attached handset a moment later. As much as Microsoft's revealed, it's still leaving plenty of questions about its Windows Phone 7 strategy unanswered; in some cases, we think they're simply being careful to release a steady stream of information as the company and its partners get closer to launch, but in others, it's evident that the team simply doesn't yet know. Mass storage -- the lack of support for microSD expansion and file management, for instance -- and Marketplace content control are a couple big examples of areas where clarification and further development are undoubtedly needed, and we're looking forward to seeing this all develop over the course of the year. Ultimately, Microsoft needs buy-in not just from carriers, manufacturers, and users, but also from third-party developers -- the Marketplace needs to be bursting with great content to legitimately go up against the like of Android and the iPhone, both of which have had a strong head start in putting vibrant ecosystems together. Concerns aside, though, we're extremely excited by what Microsoft has done so far, and it's hard not to catch a bit of their enthusiasm along the way -- they're proud of how definitively they've thrown away the shackles of Windows Mobile's legacy. Now, it's time to deliver on the promise.